To acclaim in the Kurdish and Israeli news media, the Kurdish Directorate of Jewish affairs has been staging an exhibition of photos and documents and a candle-lighting ceremony to commemorate the expulsion of Jews from Iraq and Kurdistan. A visit from Israel by the kippa-clad analyst of Kurdish-Jewish affairs Zack Daniel lends legitimacy to the event. 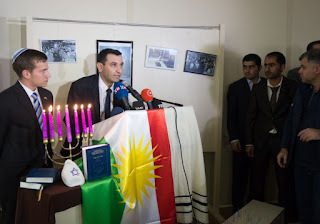 But there are no Jews left in Kurdistan - to quote an expert - and one source casts doubt on the Jewish credentials of Sherzad Omar Mahmoud Mamsani, the Directorate head. It alleges that Mamsani is an Iranian spy with no Jewish links. In 2012, PoNR posted a report which named Sherzad Mamsani as a protagonist in the abduction and murder of Mawlud Afand, editor of the Israel-Kurd magazine which Mamsani now claims to have published himself. "The Jewish Encyclopedia of 1906 reported that infighting between the Kurdish tribes created issues for the Iraqi Jews living in the region and that Jewish burial grounds there were desecrated. It also listed the Jews in Kurdistan during those times. After WWI, some Iraqi Jews immigrated to the US, but that was not due to danger, but more for opportunity. In 1934 New York saw the formation of the “Iraqi Aid Society” a social service-Chesed organization formed to serve the Iraqi Jewish community that had moved here. Iraqi Jews do not see themselves fit into the general Sefardic spectrum and only recently has the community identified themselves with the other Sefardic groups in New York. The Iraqi Jewish community began having issues in the late 1940’s. There are some who accuse Zionist agitators for having caused the unrest. Others claim Iraqi involvement in the Israeli war changed things. Be that as it may, in 1950, a bill introduced in Parliament allowed Jewish citizens exit visas so long as they renounced their Iraqi citizenship. Over 100,000 Jews exited within a few years. Many others pretended to convert while maintaining a semblance of Jewish tradition in hidden manner. All leaving were stripped of their assets. In 1992 Kurdistan got its independence in the Northern region of Iraq. Saadoun, in his article for Al-Monitor quotes a spokesperson for the KRG Ministry of Endowments and Religious Affairs, who said that it was already in April of this past year that the KRG parliament, “issued the Law of Minorities, which was unanimously approved before being signed by KRG President Massoud Barzani. This law confers to every religious community in the Kurdistan Region of Iraq the right to establish a representation office and practice its rituals freely.” The spokesperson estimated that there are 300 Jewish families currently in Kurdistan and that KRG welcomes those other Jews who would like to return to the region. There is a caveat. The Jews will not be allowed to be involved in politics at all. Iraqi government officials approve Kurdistan’s move, also with a caveat, telling Saadoun, “The opening of the representation office for Jews in the KRG is a good step, provided this office remains free from the influence of the State of Israel, since Iraq rejects any relations with that country” (as reported in Al-Monitor). As for Iraq, they have not made a similar offer."